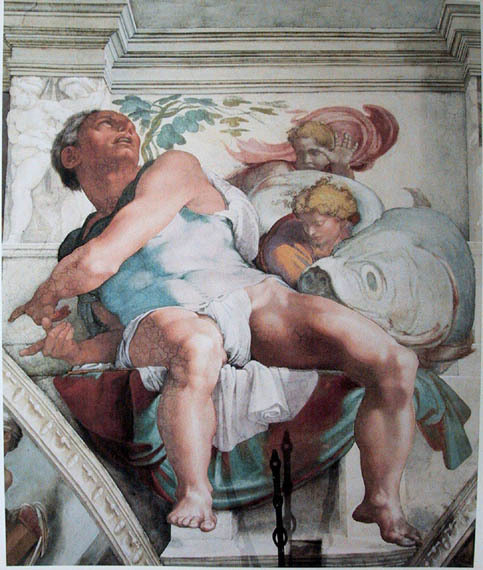 The prophet Jonah as painted by Michelangelo in the Sistine Chapel. In the metaphorical language of mythologist Joseph Campbell’s Hero Cycle (or Monomyth), the hero’s journey moves from the comfort of the known world into the frightening and dangerous unknown through an unprecedented crisis; using Western mythology, he likens it to Jonah being swallowed by a whale. The entrance into the belly of the whale represents a metamorphosis, crossing the threshold between the known into the unknown, and being reborn as an entirely new individual. While it may appear to be a low point – one seemingly dies to the world one has always known – it is in fact the beginning of the great and perilous heroic journey of one’s life. In the terms of depth psychology, this is the point in one’s life when exploration of one’s unconscious begins, when the great, heroic inner journey truly takes shape.